Thank you for your comments about Camp Gigi! For those who insisted on a photo of the finished product from the makeover…here it is! 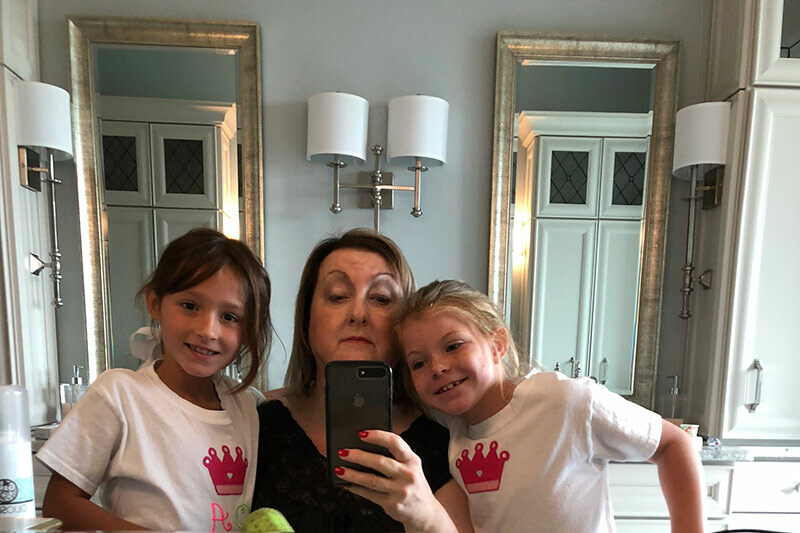 And yes, I wore the makeup all day with great pride, which just thrilled the girls! So many of you shared ideas and traditions from time spent with your grands, and each story was wonderful to read. I want Ribbon in My Journal to be a community of people that share things to encourage one another. I will be sharing more with you on that in future posts. For the world we are living in, I believe there is always more room for positivity and encouraging words. In light of this, please share Ribbon to your friends! We have formed a very special community here, and I hope they will sign up to be a part of it. Many of you have sent emails asking me what all we do here at Hoffman Media. So in an upcoming blog post, I will be sharing our projects and some of what goes into creating our publications. Most important to me is that our company maintains values that are good and of integrity. I love celebrating people and the things in life that make moments unique and special to our individual stories. I understand that some things are so personal that you may not feel comfortable posting them in the comments. If you want to email me, please do so at ribbon@hoffmanmedia.com. It may take a couple of days for me to respond, but I will. Thank you again for your love, support, and encouragement! Phyllis, I have been receiving Ribbon in my Journal up until late November 2018, and then it stopped. I tried to sign up again and submit my email address, however this site would not accept it , as it said my email is already being used. Would you please see that I get reinstated and start receiving your wonderful blog once again. It is the highlight in my days! When two of my nieces were much younger they came to spend a couple of weeks with me each summer. We always did fun projects for them to take home, laughed and took photos. I made each of them a book of the photos to have for keepsakes. One year in Victoria there was an article about fairy houses. I was intrigued and that year one of our projects was for each of us to make a fairy house. What fun! That year I had also discovered the book I’m in Charge of Celebrations by Byrd Baylor. School teachers use this book to encourage children to find celebrations when they think they have none. In the book the young girl telling the story mentions that she kept a notebook to write down her celebrations. So, I bought each of the girls and myself a blank journal, decorated them and inscribed inside…My Book of Celebrations. I still write down my celebrations. 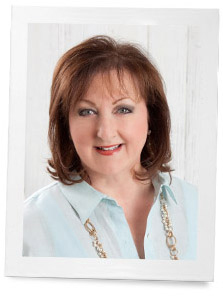 Victoria has been such a delight in my life since the premier issue…I have kept all issues! I cried when the magazine was discontinued for a few years. I have learned so many things and been introduced to so many people. I have so many stories to tell that are connected from articles I read in Victoria. I’m always anxiously awaiting the next issue as I continue to look and read thru the current issue. Thanks for the most wonderful publication and for such joy that it brings into my life. I’ve been blessed. Thank you, Phyllis, for the cheer you bring to me. I’ve enjoyed ‘tea parties’ with my grandchildren and love looking back at pictures of our ‘parties’. I loved sewing for them. They are all teenagers now, but are so precious to me. My husband is now dealing with very serious health issues after living a vigorous and productive life. I am thankful he remains his cheerful self and we make the best of each day and I SO look forward to your magazines and this journal. Nice to have a ‘happy place’. You make such a difference to me! Aren’t you all, THE ONES?! You are truly blessed to share this powerful bond!! We’ll never know the impact that this time of fellowship will have on your girls and their influence in this world! What a great time you all had! Thank you so much for sharing your precious time with your adorable girls. Everyone looks so beautiful! With camp Gigi stories you have helped me get through a difficult time saying goodby to my mom these past few weeks. Time spent with your loved ones is something to be treasured forever. Thank you so much! Anne I am so sorry for your loss. Time is all we have and your are right. I have loved your series of Gigi camp. I held a camp for my nieces for many years. It was a blessing to spend time together forming bond that won’t be broken. We too, had a spa day at home. We didn’t think of a makeover, but I know they would have loved that! All three of you are precious! trace their footsteps back to these beautiful fond memories you have created and shared with them. And I can hear them say “this is what my Grandmother Phyllis did with me” It’s tradition! You are a special lady Phyllis and a wonderful loving Grandmother, you have my applause! Thank you. I made a little book for each of them in hopes they will remember in years to come. I know I will. I cherished every moment. That is wonderful. You are giving these girls some great memories. Spending time and doing fun things together is more important than all the gifts you buy for them. I am 71 years old and had the best day playing baseball today with my great niece and nephew. They loved it. I probably won’t be able to walk tomorrow Morning but we spent a great day together. 71 and playing ball is amazing. How wonderful you are! So fun! I enjoy reading of all your adventures with your precious grands. This has put a big smile on my face today!! You look mah-ve-lous! And your precious makeup artists look so proud!! That is what it is all about, whether you are a Gigi, a Mimi or a Goddess!! Thank you again for sharing your wonderful day with the girls. They did a fantastic job….you look beautiful! Those are memories that will last long after our generation is gone. And thanks for your “Ribbon” . You and the ladies of the “Ribbon” are a bright spot in my day. Yes, there is all too mich sadness and anger in the world. I’m so very happy we’ve found each other. You all make my day too!!! thank you. These are memories we , the Gigi’s, hold in our hearts forever. They grow up to fast as it is, and if we can give them good memories as well, then we have left our footprint on their hearts. Such love on all three of your faces. Look how proud the girls look…I bet you all had fun. I LOVE ALL things Hoffman Media! Thank you for all the wonderful magazines and books. thank you June. I work with some amazing people. I will be sharing some of the new projects we have completed. I am so proud of our creative people who make my life wonderful. 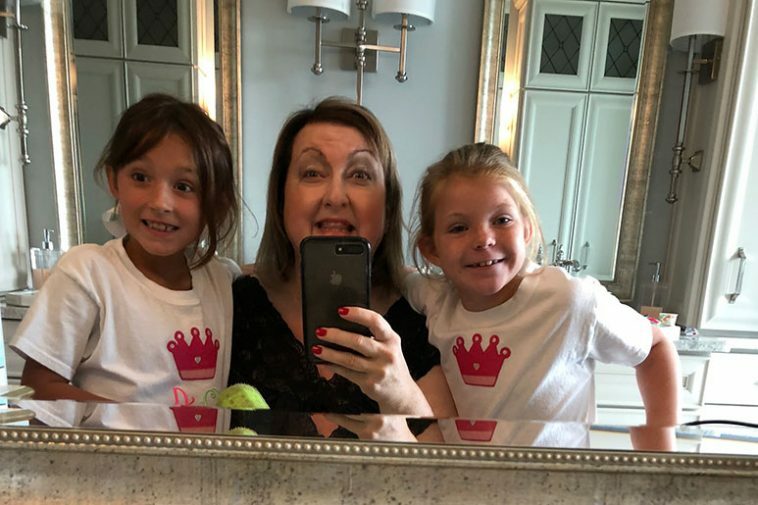 How fun to share this time with your grands….little cuties! Summer vacation makes this all possible XXOO! That’s wonderful. Looks like each of you made some great memories that day! You are so sweet and courageous, how loved those little girls must have felt! My mom wasn’t able to be there for me as I grew up (and I never had a Gigi!) so I love learning and being inspired by ladies like yourself and the wonderful women who comment. Thank you for sharing! They did a pretty great job!! Thank you for sharing with your “community”. We are a very blessed group. Cutest pictures ever! Your makeup looks great; those young makeup artists should be very proud. They will never forget the special times they spend with you. I love your magazines and your blog! Thank you for sharing so many wonderful thoughts, stories, articles, and ideas. I wish we could plan a Ribbon in my Journal fabulous tea party weekend. It could be simply a wonderful gathering for your readers to meet and spend time with you; it could be a fundraiser for a worthy cause; it could be a celebration of great women (and men!). What would we do without them?!! Have you ever done anything like that before? I wonder how many would come? It would be so much fun to have a Ribbon weekend!!! I would come in a heartbeat!! !